The Shipyard Hazards Standard (29 CFR 1915) is beginning to get some attention from OSHA, rather predictably, since the standard hasn’t seen a major revision in about 35 years. While some major revisions have included the incorporation of consensus standards, there’s no clear strategic that’s apparent, but it doesn’t appear that options have been removed from the table. Separation of the subpart E standards into three different subparts. 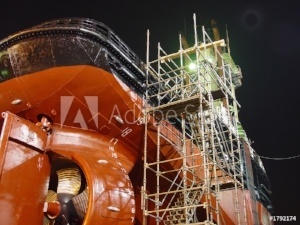 Despite improvement of equipment and the publishing of consensus standards such as the ANSI Z359 family, people who work in shipyards are continuing to get injured, sometimes severely, and at times to the point where they are killed. We know that falls, especially those to lower levels, continue to remain on OSHA’s top-ten list of reasons for workplace fatalities. Despite targeting efforts through safety stand-downs and the Focus Four program for construction, employers’ are having a difficult time drawing down those numbers. If Federal regulations weren’t difficult enough already, there’s a significant amount of crossover and differentiation between 1915, 1910, and 1926. This leads to increased confusion, especially on the part of subcontractors (who happen to be at one of the highest levels of risk). Different regulations for different phases of projects, different project locations, and different owner/operators compound this confusion. For instance, fall protection standards are different depending on which OSHA rule applies. For General Industry fall protection starts at 4’, while for construction 6’ is the rule. In maritime or shipyard, and depending on rule application, it can be either 4-5’. Some companies adopt the most stringent form of protection at 4’, but depending on the design basis for the project, this can add complications. Regardless of the statute, one must still consider the General Duty Clause. If there’s one thing that has changed in 35 years, it has been technology, which has grown in size and speed on an exponential scale. Improvements in materials, engineering, and production methods have brought us not only safer personal protective equipment, but also safer construction and building materials that can address some risks through application of the higher order hierarchy of controls. Additionally, improvements in the developments of consensus standards (e.g. Z359 Fall Protection standards, Z590.3 Prevention through Design) allow us to create safer environments and assist engineers with adapting the work to the human (think ergonomics and human factors) versus increasing risk and complexity by poor design. At this point, moving forward is necessary, but so is your input to OSHA. OSHA is requesting comments on improving conditions in shipyards, but it’s necessary to do it before the closing date of December 7, 2016.